Kirk Long of the Ateneo Blue Eagles has been named Model Collegiate Player of the Year, the highest honor conferred by the Philippine Collegiate Champions League to players who graduated from college. Kirk Long was cited for successfully combining academic and sports achievements completing collegiate education while playing competitive basketball and consistently upholding the high standards of performance and sportsmanship. 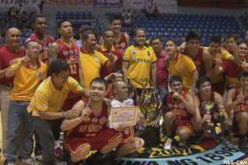 The PCCL and ABS-CBN Friday hosted “A Toast,” an event where Kirk Long and other players were honored. Peter Musngi, managing director of ABS-CBN Sports, was also honored for his valuable support and contribution to the realization of “One National Collegiate Champion” concept. PCCL chairman Reynaldo Gamboa presided over the award ceremonies. University of Cebu Webmasters coach Roehl Gomez has a definite answer when asked if Junmar Fajardo is ready for the Philippine Basketball Association. 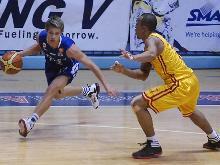 “Pwede na,” said Gomez, a former sharpshooter who plied his trade with Alaska and Pop Cola in the professional league. Fajardo played his last game for the Webmasters on Monday, a loss to the San Bed Red Lions in the Philippine Collegiate Champions League battle for third. But before entering the draft for Asia’s first play-for-pay basketball organization, the 6-foot-10 standout will be honing his skills with ASEAN Basketball League expansion team San Miguel Beermen Philippines when the team kicks off its campaign in January next year. Gomez, who coached Fajardo throughout his collegiate career, said that Fajardo has improved through the years and he only has to be used to playing against big men in the next level, something that he will surely get playing in the eight-team ABL field. “Mature na siya maglaro. Ang kulang pa sa kanya eh ‘yung game na pang-malakihan kasi sa Cebu, parating maliliit ang mga kalaban niya,” said Gomez. Luckily for Fajardo, he was able to face quality big men in an international event after UC epresented the Philippines in the Summer Universiade in Shenzhen, China earlier this year. The Webmasters lost all their games, but Gomez said that Fajardo gained valuable experience because of the tournament after facing bigger opponents from Russia, Lithuania, Ukraine, Japan and New Zealand. “Hindi ko naman iniisip na mananalo doon pero ‘yung malaking bagay ‘yung nakuha nilang confidence na nakapaglaro sa international competition lalo na kay Junmar na may nakalaban siyang malalaki. Hindi mababayaran ‘yun,” said Gomez. Ateneo coach Norman Black has seen the improvement of Fajardo himself. A highly-regarded coach for big men, Black now coaches Greg Slaughter, a former University of the Visayas player who had numerous battles with Fajardo in the Cebu collegiate leagues. “Fajardo is a very good player. I’ve been coaching against him for the fourth time and he has played well every game that we’ve played against him,” said Black after beating UC by 47 points during the PCCL semifinals opener. The only question now is when Fajardo will join the PBA. “Siguro kapag may San Miguel team na mag-number one pick, bababa na siya [sa draft],” said Gomez.